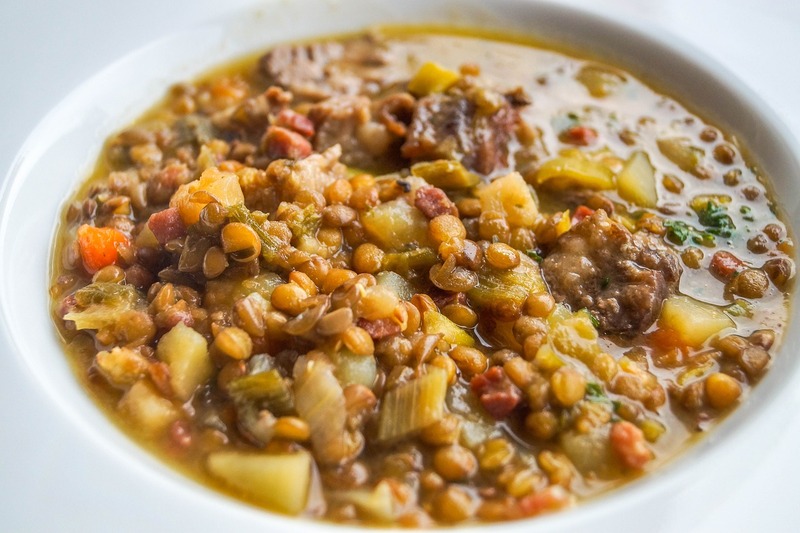 The German lentil soup is a classic among all German soups. We tried out several options: Using lentils from a can and dried ones. We came to the conclusion: Dried lentils are the best. You can reduce the cooking time when soaking them the evening before in water, and let them sit over night. Just just need to boil them the other day in the same water. In Germany these recipes such as Lentil Soup or Split Pea Soup are called "Eintopf" which means literally "One pot". The fact that all ingredients are cooking in one pot at the same time, makes cooking easy. Just stir frequently and, if you use sausages, boil the sausages some minutes before the soup is ready. It is also easy to make a vegetarian dish: Just don't use the bacon and sausages. Happy Cooking! - Wash dried lentils, then soak them in water the day before. They should be covered with water. Let sit covered over night. - Peel potatoes and cut them into small cubes. - Cut celery root, stalks and carrot in small pieces. - Chop onion, cut ham in small cubes. - In a medium to big sized pot heat oil, add onions and saute for 1 minute. - Use lentils with the soaking water, add to onions. Fill up with water if you don't have enough (lentils soak up the water, so you need to add some, lentils should always be covered with water). - Add potatoes, carrots, celery, and bay leaves. Add some more water if needed. - Bring to a boil, let simmer (covered with a lid) on low heat for about 1 hour until lentils are very soft. Do the test, if they are not soft, let them cook longer. - While the soup is cooking, add mustard, vinegar, herbs, salt and pepper to taste. - Stir frequently so it won't stick to the bottom of the pan. Add some water if the soup gets too thick. - 10 minutes before the soup is ready add the sausages to warm them in the soup. Of course you could boil them separately but the typical way is to cook them in the soup. - If you want cut the sausages into pieces, and add them to the soup until they are cooked. - Add parsley before serving.Serve the lentil soup with fresh farmers bread and butter. In Southern Germany the soup is combined with the Southern pasta specialty "Spaetzle". In this case you would cook the Spaetzle separately and serve them with the soup. For a vegetarian version: Instead of using ham and sausages just cook the lentils with the vegetable. Instead of oil use lard. Add vinegar before serving or use it as needed at the table. If you don't soak the lentils the day before the cooking time will be on low heat (simmering) up to 3 hours. Oh, I see, this is a mistake. of course I mean bay leaves. Don’t use laurel leaves! But now you know for sure I am German. Let me know how the lentil soup was. Guten Appetit! Your recipe is going in my book. the bay leaves are in the recipe now! thanks for helping. I was born in Kassel Germany we put small meat balls in ours try it. Really good. I know Kassel! Oh, I am sure it will taste good. I have to try this one. Have you subscribed to the blog? Many christmas recipes will come and I think they will be visible only for subscribers. I am making some changes like the new design and maybe an obline community site where members can talk about german food and exchange ideas. thanks for your message! Danke. I lived in Bitburg for five years. My most favorite was the chicken and the salads. Could you tell me where I can find recipes for German roasted chicken and german homemade salad dressings. The salads I had consisted of some bib lettuce, shredded cucumber and carrots and house dressing. It was amazing. Also what makes your peas and carrots so delightful? Linda, I guess it’s the butter and a hint of nutmeg which makes the peas and carrots so good. Dressing: you must be a bit more specific about that. it is oil and vinegar? Iam always make Lentilsoup , now from you i learned diffrent ways to make like bayleaves and meatballs and all the diffrent seasening u can put . tx ! Oh i live in the States but iam from small town called Pickliessem..
bay leaves are always used for German soups. Meatballs, do you mean the german burger or Fikadelle? Try it, it is soo good! I’m trying this soup today! Unfortunately I’ve never seen any Celery root in my part of the U.S.
Hope I can get by with only the stalks…. I know, the celery root is not in every supermarket. Don’t know what they do with the roots? Use some stalks and it should be fine. add the bacon at the beginning with the onions. the lentils have to be covered about 1 inch. when the cook they get thick, so you can add more water as needed. mom used ham bone in the beans as they cooked everything else sounds the same except on the end she always made a browned flour ruew that she would stir in before serving. I still make it that way to this day. Thank you for the memories.